A very happy 2017 to all of my lovely readers! If you missed yesterday’s post, I shared my recipe for these sweet and salty caramel profiteroles, as well as my resolution to aim for quality over quantity in this brand new year. Anyway, enough looking back. Onward and upward! Today’s recipe is right back to basics, but something my blog is definitely missing. Everyone needs a fail-safe vanilla sugar cookie recipe, that holds its shape and won’t spread while baking. And to prove just how unspreadable this cookie dough really is, I’ve used it to bake some pretty unforgiving Scrabble cookies. 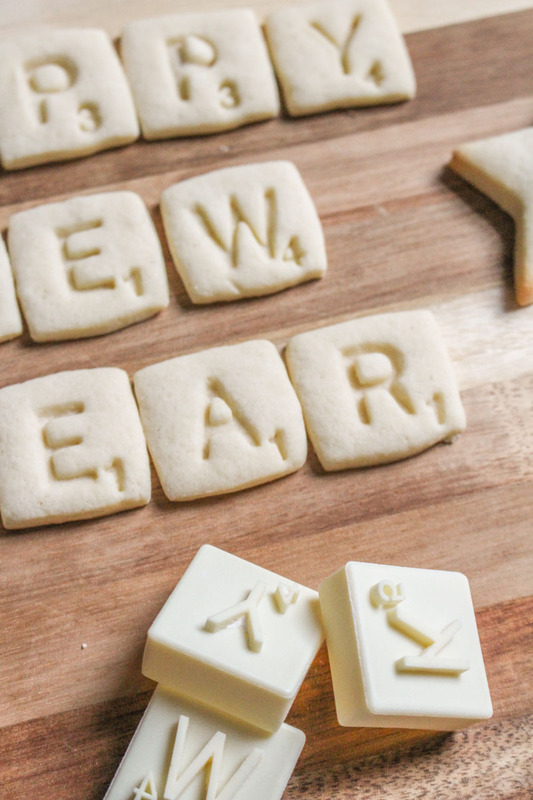 The Scrabble cookies were perfect for our annual New Year’s Eve board game night, which this year was a tie for the first time ever. At least that’s better than my normal hideous performance. And I finally beat Katie at Monopoly! The only way is up. I’m predicting a Charlotte win for 2017. 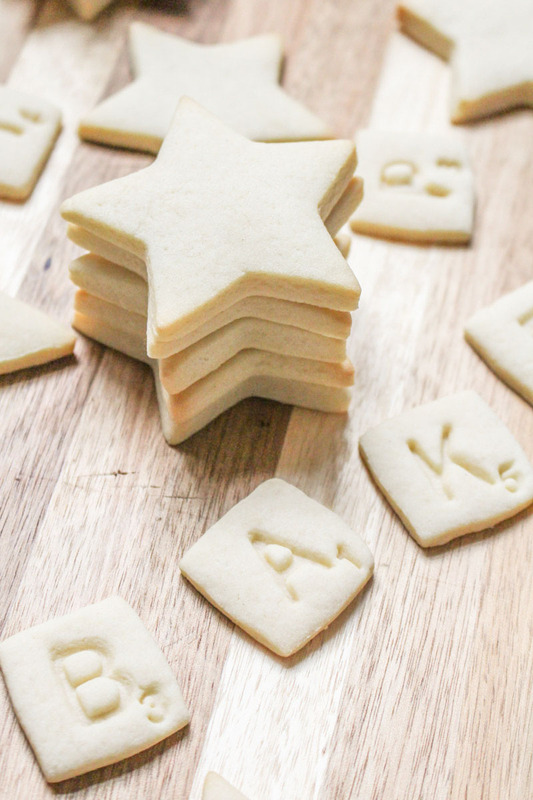 If you’re interested, these Scrabble cookie cutters were a Christmas present from one of my bridesmaids – and they are amazing! I was a bit sceptical at first, but just look how well they turned out ? Tip though: if you are going to use them, make sure you chill your dough for half an hour first, and make sure you dip the stamper in flour before you press it into the unbaked cookie. Otherwise it might stick. She also got me some dinosaur cutters, but I’m going to save that fun for another day. Back to the cookie dough. It is stupidly easy to make, in one bowl, and barely needs to be chilled. I would advise giving it at least half an hour in the fridge, just to make it a bit easier to work with, but I doubt you would get any spreading in the oven either way. It’s a bloody good dough! And it tastes sugary sweet with more than a dash of vanilla – so make sure you use a good quality vanilla extract. With so little ingredients here, there’s no where to hide. The almond extract is sort of optional, although I think it makes the cookies taste all the better. Don’t rush out and buy some if you haven’t already got it, but if there’s a bottle lying around then I definitely recommend throwing half a teaspoon in. That’s a tip I learnt from Sally, by the way. So you know it’s good. The baking time in the recipe below is for soft cookies, but if you want them crisp and crunchy then leave them in the oven for a couple of minutes more, until the edges turn golden brown. And if you’re making tiny Scrabble cookies like me, then 6 minutes in the oven will suffice for soft cookies, and 8 for crunchy. The perfect vanilla sugar cookie, which will perfectly hold its shape in the oven without chilling. Soft and buttery, these cookies can be iced or left just as they are. 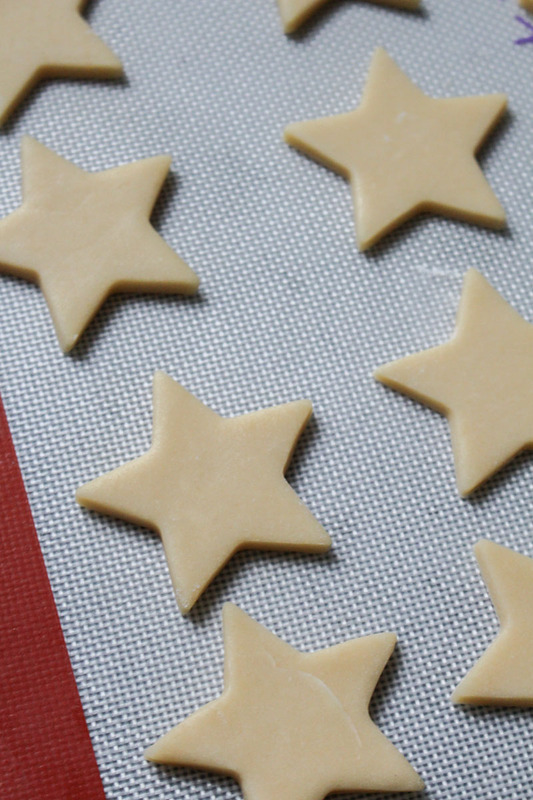 Beat the butter and sugar together using a stand or hand mixer, until light and fluffy. Add the eggs, one at a time, along with the vanilla and almond extracts, beating well between each addition. Add the flour to the bowl, along with the baking powder and salt, and mix together on low until a dough forms. Split the dough in half, form into balls, and wrap in clingfilm or plastic wrap. Place in the fridge for an hour if possible, as this will make the dough much easier to work with, especially if you are going to stamp the top of the cookies. You can bake the dough without refrigerating though, and it still shouldn't spread. When you are ready to roll out the dough, preheat the oven to 180°C / 355°F (160°C fan), and line two large baking sheets with baking parchment or a silicone mat. Roll out the first ball of dough on a floured surface using a lightly floured rolling pin, until about ¼ inch thick. 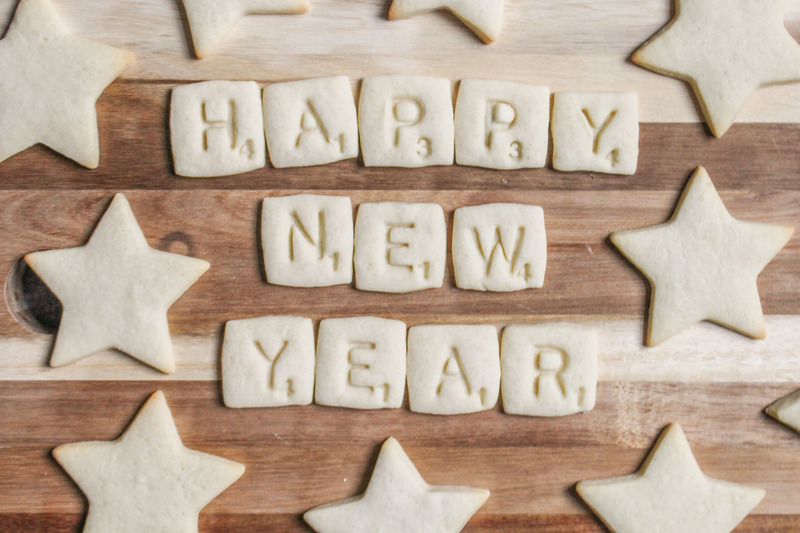 Using cookie cutters of your choice, cut out the cookies and place them on the baking sheets. Stamp the top of the cookies if using cookie stamps - dip the stamps in flour before pressing into the cookies to avoid sticking. Bake the cookies for about 8-10 minutes, depending on the size of the cookies. For the small Scrabble cookies, reduce this time to 6-8 minutes. Turn the baking sheet around half way through baking to make sure they are evenly baked. If you prefer your cookies soft, then remove them from the oven as soon as they start to go ever so slightly brown at the edges. Leave the cookies to cool for 5 minutes on the baking sheet, and then transfer to a wire rack to finish cooling. The baked cookies will stay fresh in a air-tight container for almost a week - there is no need to keep them in the fridge. The baked cookies can also be frozen for up to three months. Defrost at room temperature and then store in an air-tight container for up to 7 days. The unbaked cookie dough can be frozen for up to three months. Wrap the dough tightly in cling film or plastic wrap, and then defrost at room temperature before rolling out and baking. You trounced me at Monopoly. And also at baking. 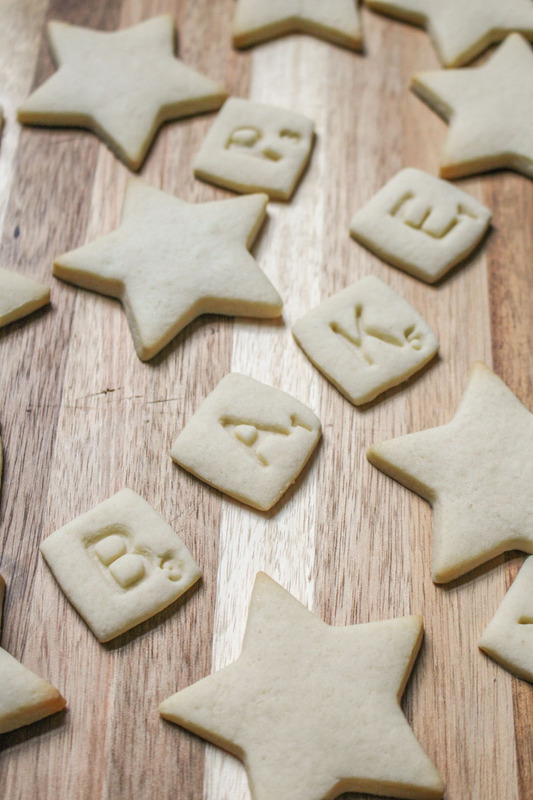 The scrabble cookies are super cute and I still think we should have dipped the stars in chocolate.